Tracks left by a pterosaur that shambled across a muddy Alaskan floodplain some 70 million years ago offer rare proof that flying reptiles thrived in the far north, paleontologists say. And they’re also signs of how surprisingly rich and diverse life was in the near-Arctic during the time of the dinosaurs. Since then, he and his colleagues have found another similar pterosaur track nearby, followed by more than a half dozen others — of a much smaller size — over 15 kilometers away, in the fossilized bedrock of a drainage known as Riley Creek. These distinct sets of tracks not only show that pterosaurs lived in Alaska some 70 million years ago, the paleontologists say, they also suggest that the environment of the sub-Arctic was lush and diverse enough to support separate populations of the flying reptiles. “Based on the different sizes of pterosaur traces, which suggests different body sizes, the presence of multiple pterosaur taxa at such a high northern latitude illustrates a new level of complexity to the food web within this ancient polar continental ecosystem,” the team writes, in the journal Historical Biology. Adding to the prehistoric menagerie, Fiorillo’s team also found footprints belonging to Magnoavipes denaliensis, a giant bird that shared the skies with pterosaurs, near the larger set of reptile tracks. 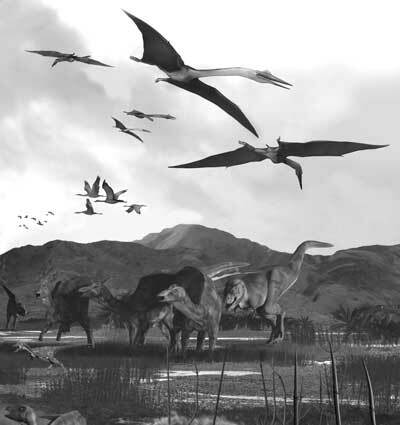 “The presence of two different sized pterosaurs, combined with the numerous fossil bird tracks … indicates that the ancient Arctic continental ecosystem … was biologically rich enough to support significant biodiversity amongst the vertebrates that flew over the landscape,” the paleontologists note. 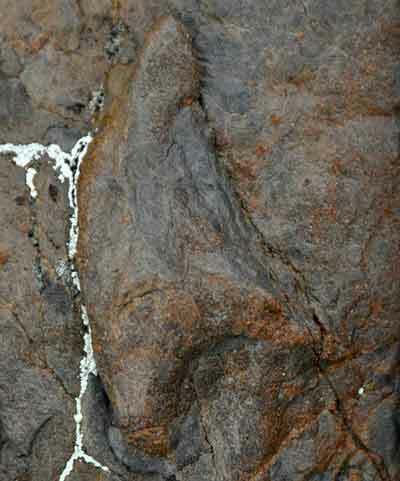 At 18 centimeters long by 6 centimeters wide, the bigger pterosaur tracks are “very large” compared to others that have been reported, Fiorillo’s team says. And they’re “considerably larger” than those of the well-studied Pteranodon, whose wingspan spread more than 6 meters. The more diminutive set of prints, meanwhile, was only about one-fourth as large — about 6 centimeters by 4 centimeters. 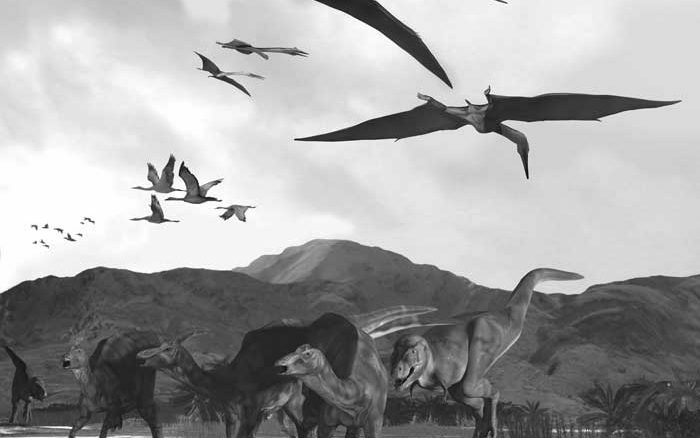 But in addition to the new-found prints, the team also studied plant fossils and layers of ancient sediment at the both of the track sites, and found that the two groups of pterosaurs likely lived in quite different environments, each suited to the animals’ unique needs. 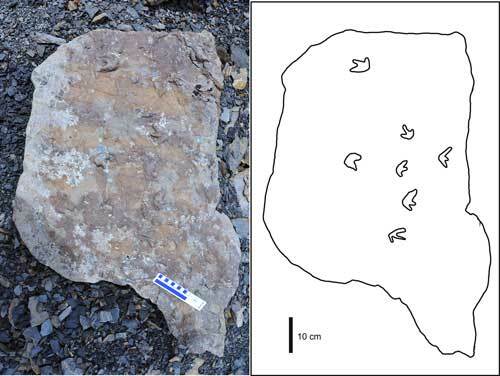 Fossils found at the site of the smaller tracks, at Riley Creek, revealed evidence of low-lying ferns and tall trees — signs of a denser, more forest-like ecosystem that may have been suitable for smaller fliers. The larger tracks near Sable Mountain, by contrast, were found in a wide swath where water flowed freely and sediment was laid down regularly — a broad, river plain that likely provided more room for larger animals. “Since modern large birds tend to roost in open areas, we state that during the Cretaceous, larger winged vertebrates preferred more open areas, while the smaller winged vertebrates were unaffected by vegetative cover and river dynamics,” the team writes. The likelihood that large and small fliers lived in separate niches is supported by the fact that the giant pterosaur tracks occur near the traces of the equally large bird Magnoavipes, which were at least 30 percent larger than modern sandhill cranes. Exactly what species of pterosaurs left the newly found traces may remain a mystery, but their discovery hints at the diversity of life that occupied the skies of ancient Alaska, the team concludes. “There are now two distinct body sizes represented by pterosaur tracks, a type of pterosaur with a very large body size, and one with a much smaller body size,” they write. Just to make sure, were the tracks found in strata that actually were in Alaska, or near Arctic latitudes, at the time of deposition? I ask because the North American Plate has been moving west for a few hundred million years. Much of the State of Washington consists of “terranes” swept up by that movement, and a few of those geological terranes had something of a southern origin. A single impression is called a print. A track is a series of prints. Otherwise, cool article.